On June 25, 1950, the army of North Korea, supported by the Soviet Union, launched a full-scale attack against South Korea. Within two days, the capital of Seoul had fallen. United Nations troops quickly came to South Korea’s defense with first American forces landing in Korea by July. These American and UN soldiers were thrust unprepared into the harshest battle conditions in an unforgiving land. 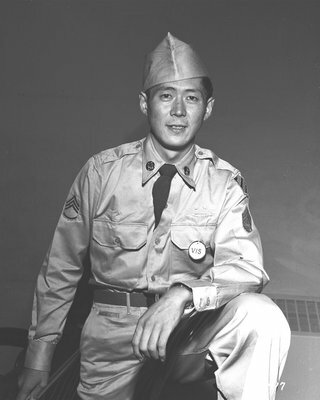 Hiroshi Miyamura in uniform. In the Spring of 1951, after surviving a brutal winter in the Chosin Reservoir, all was finally quiet along the Kansas Line – the line that separated the Chinese from the UN forces near the 38th parallel. Just before midnight on April 24, Chinese soldiers stormed the U.S. camp in never-ending waves. Outgunned and outmanned, the U.S. forces fought until they had no choice but to withdraw. Those who could not escape were taken prisoner. Among those American soldiers captured by the Chinese were best friends Hiroshi “Hershey” Miyamura and Joe Annello. During the attack, Hiroshi heroically fought against the Chinese forces, allowing for his squad to safely withdraw as he and Joe were taken prisoner. Hiroshi suffered painful wounds, but none so bad as Joe – The blast from a grenade had injured his spine and he was unable to walk. For miles, Hiroshi carried Joe as they marched until the Chinese soldiers forced Hiroshi at gunpoint to leave Joe on the side of the road to die. There, they said what they thought was a final goodbye. The 2018 National Memorial Day Concert honored Joe and Hiroshi’s friendship, endurance and heroism through horrific ordeals.